Ending identity-based discipline disparities will require transformative partnerships that focus on both school-level and systems-level change. Representatives from Open Society Foundations and The Atlantic Philanthropies discuss philanthropy’s role in school discipline reform. A middle school science teacher in Denver, Colorado, finds success using restorative approaches that focus on empathy rather than punitive zero-tolerance school discipline policies. Are We Ready to #MeetTheMoment? A community-based organization frames its collaboration with multiple stakeholders around changing from a “culture of discipline” to a “culture of dignity” within the Los Angeles district. In Nashville, the school district has partnered with law enforcement, juvenile justice, community organizations, parents, and students in efforts to tackle inequitable disciplinary practices. Partners from Chicago Public Schools and local education organizing groups share their experiences with the PASSAGE initiative. An education organizer in New York City argues that the lived experiences of students must be placed at the center of strategies aimed at ending systems of inequitable discipline policies. 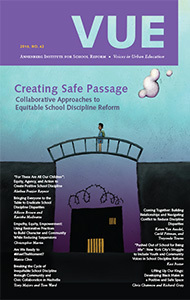 This issue of VUE is inspired by PASSAGE, which stands for Positive and Safe Schools Advancing Greater Equity. With funding from The Atlantic Philanthropies, the two-year project brought together community organizations and district leaders in four urban centers to examine identity-based discipline disparities, exclusionary policies, and punitive practices in public schools and to work collaboratively toward interventions to eliminate them. The four sites were: New York City, Chicago, Los Angeles, and Nashville. Through the lenses of various stakeholders (district administrators, community organizers, teachers, funders, and academics) engaged in discipline disparity work across the nation, this issue explores both the challenges and the opportunities that emerge in bringing about transformative systems change that will eliminate discipline disparities and create a positive and equitable climate in schools.